The U.S. Fish and Wildlife Service is considering adding Monarchs as a threatened species under the Endangered Species Act. A one-year review is underway to monitor the butterfly’s status. Since the 1990s the population has plummeted from about one billion to approximately 35 million. That may seem like a substantial number, but the Monarchs need stronger numbers to be resilient to other threats such as harsh weather. The reason for the decline is primarily because of loss of milkweed habitat in the agricultural heartland of the United States. With the development of Monsanto’s Roundup and Roundup Ready (glyphosate resistant) seed, farmers are now able to spray glyphosate directly on their corn, soybean, and sorghum crops. Roundup also destroys milkweed. Secondly, with the push for ethanol, farmers have begun to plant corn on conservation land. If the Fish and Wildlife Service determines that the Monarchs are threatened, they will set aside land for milkweed. 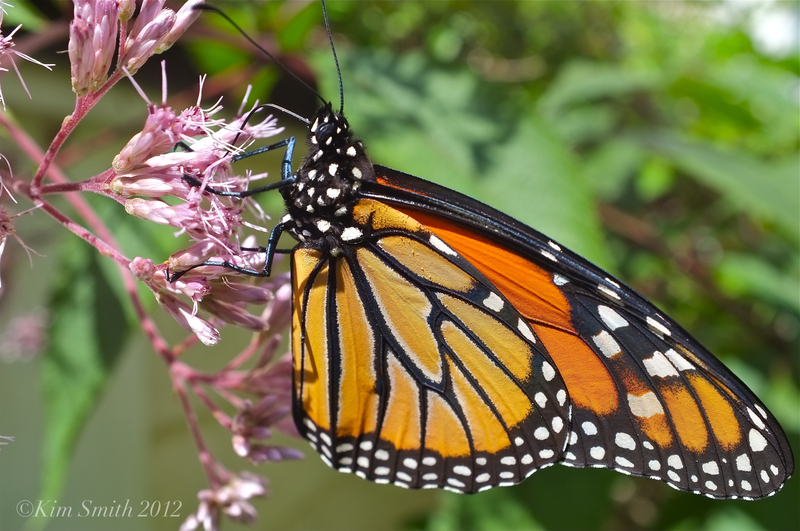 This entry was posted in Angangueo Michoacán Mexico, Gloucester Massachusetts, Monarch Butterfly Film, Monarch Butterfly in Crisis, Monarch Butterfly Migration in crisis and tagged Eupatorium purpureum, Joe-pye weed, Monarch butterfly, Monarch Butterfly Endangered Species Act, monarch migration, monsanto, Roundup, Roundup Ready corn, U.S. Fish and Wildlife Service on January 12, 2015 by Kim Smith.